Kind of an odd post, but for some reason the Quest for Glory games keep coming up in conversation around me lately. I'm not upset about this. I love the Quest for Glory series. They're my favorite PC games of all time, and likely the reason that I got into table top RPGs at all. 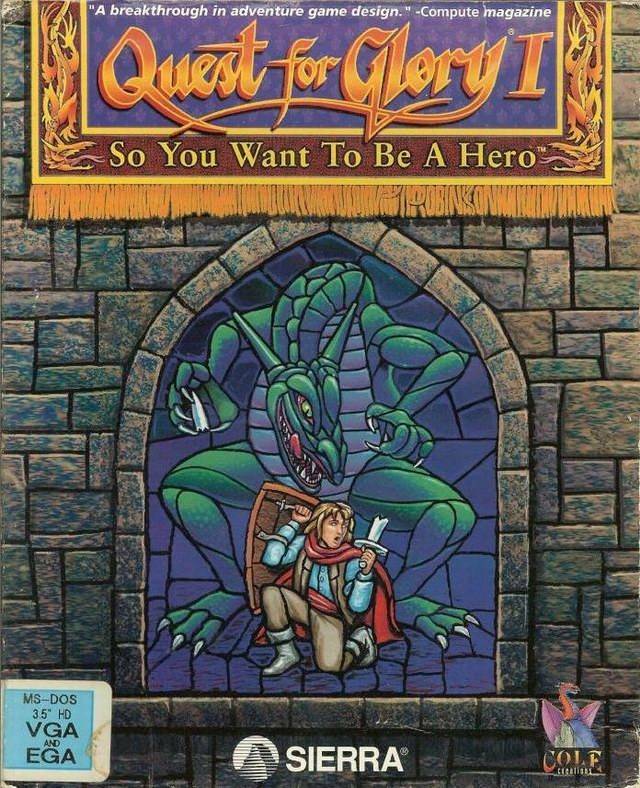 For those that don't know Quest for Glory is a series of game from the golden age of Sierra adventure games. 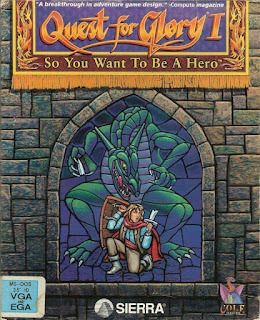 Like King's Quest, Space Quest, and Police Quest, Quest for Glory (Originally Hero's Quest before they were sued) is an adventure game where players type commands into a text box for the character to interact with the game beyond the basics of movement/combat. First, you built your character's stat blocks. You decided if your character was a Fighter, Wizard, or Thief. Beyond this, you were given a stat sheet and points to build onto your stats. Want to play a Fighter that can also cast magic? Go for it. Want a wizard that can sneak? Do it. Play your stat points right, and you could have a character passable as all three classes - granted at the cost of excelling at any without a lot of work on your part. This ability to make your own character though was awesome, and revolutionary to me at the time. I don't know if other games had it, but QFG was the first one I saw it in. Second, every problem had multiple solutions. In fact, every major obstacle to the game's completion tended to have three solutions: a fighter solution, a wizard solution, and a thief solution. The fighter was what you'd expect, direct force and fighting. The wizard often relied on arcane trickery. And the thief did thief stuff. Still, having multiple paths was a lot of fun. Especially since you didn't have to do the one for your class. Nothing stopped an appropriately skilled fighter from picking a lock and going into the bandit camp the back way, before tackling the second obstacle as a fighter. And that meant you could stumble into scenarios and solve them in interesting ways a lot of the time. Third, your character progressed from game to game. At the end of every QFG game (except 5) you saved your character. Why did you save your character? So you could import them into the next game. This meant the Fighter/Wizard/Mage you made in QFG1 could continue his adventure in QFG2 starting from the same stat blocks. Sure, you could start with a default build (with the same Fighter/Wizard/Thief choice) but by importing you got the same character, their starting money, and starting stuff. Along with this progression, in QFG2 you could become a Paladin, kind of a super fighter but with some unique solutions to problems. After QFG2 if you imported your character you could make them into a Paladin. Fourth, the recurring characters were always good and gave a good feeling of being important in the world. By the end of the fourth game you are the hero of 4 lands, and the Prince of one through adoption. Along the way you meet a lot of characters. Those characters re-appear in future games, and your relationship with them continues. This gives the whole world a sense of progression and you a sense of place that was kind of amazing in the 80s/90s when I originally played. Fifth, and finally for this post, the side quest adventures could be a lot of fun. Side stories and side quests are nothing new to games today, but in QFG you had a lot of content hidden in the game. If you weren't looking for it, you'd never find your way to joining WIT or the Fighter's league. Becoming a member of the thieves' guild involved exploration or foreknowledge to stumble upon too. These also led to fun puzzles, like robbing certain houses as a thief for extra cash or taking the test to learn new spells from a friend. A lot of the world building is rudimentary by today's standards, but just having stuff in there was a great treat to find. Now the fun thing is if you add all of these things together, you basically get how I try to GM. Players build the characters they want - it doesn't have to be the best to be successful, but it has to work for them. Problems have multiple solutions. NPCs return and matter, as does their interactions with the PC. And the story, and world, grows with the character. It's all - for me - in Quest for Glory in some way or form. But what about you? Does your love of table top stem from a game? Or something else?